The Fountain is a moving depiction of the struggles of life, death and love, across a millennium - from the end of the dark ages to an age of spiritual enlightenment. The movie is all about the opposites. The juxtaposition of death and life, of love and insanity, of acceptance and struggle, of success and failure. And the realization that the opposites are perhaps the most similar to one another. 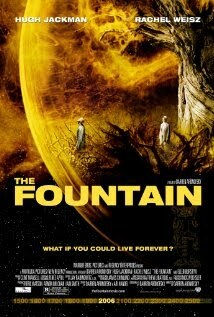 Darren Aronofsky's movies have a symphonic, non-linear aspect to them and The Fountain is no different. Through a selection of scenes from the age of the Spanish Conquistadors, the current times, and of a distant future, Aronofsky weaves a moving tale of the search for the Tree of Life. In a sense it is an exploration of the nature of life itself, of growing up and maturing. Yet the movie also carries with it an undertone of the fantastic. Of a world of possibilities no matter how ephemeral. The movie is intensely poetic in the way it unfolds. It switches back and forth between time, sometimes indulgently, sometimes abruptly. There isn't much sense to the individual scenes themselves, even though each and every one has a certain emotional charm to it. The movie is like a picture that you need to squint through to see. With the movie you need to see past the characters to recognize them. Hugh Jackman is the face of courage, determination and action. Rachel Weisz is his love, and the strength of acceptance. All said and done, the movie is not an easy watch. Be prepared to have your face furrow up quizzically through the first few scenes. Even when you do pick up the flow, it often turns out to be an eddy. Themes repeat, scenes overlap and start right up again. To compensate, however, the scenes look gorgeous. Lighting is impeccable, with a predominantly warm palette to go with the theme of the movie. And some sequences are mind blowing, like the one where Hugh Jackman walks through the city downtown to just the sound of his own footsteps. The movie could have been five stars if there it was a smidgen more literal. When you take every scene and wrap it in a metaphor, tie it with a simile, it tends to make them that much less accessible. Notwithstanding the emotion they do manage to convey. If you dislike movies like Memento, or have an aversion to time-travel tales - it is safe to say you will dislike this movie. But if you are up to running with ambiguity, and are willing to drag the brain out during a period of relaxation - The Fountain is a great reason to do that.